Press Start to Discuss: #99: When Will You Stop Playing Undertale? 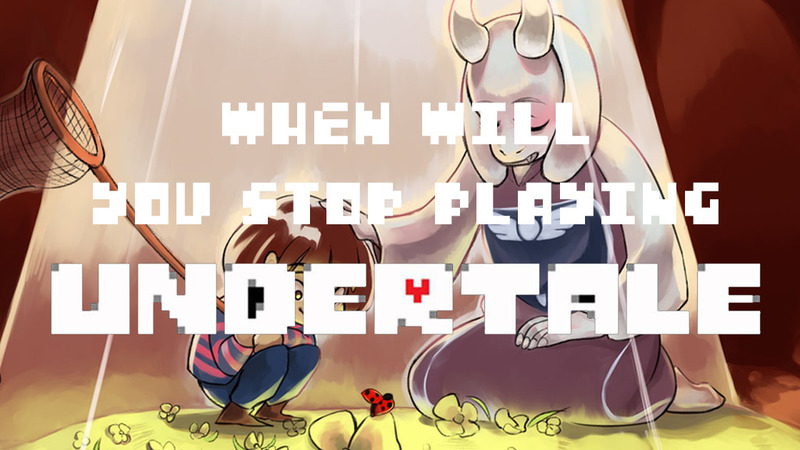 #99: When Will You Stop Playing Undertale? I've begun to notice a new trend in video games, especially in RPGs. The current generation of game designers grew up on the games that built the genre, like Final Fantasy and Ultima. When they entered the industry, they took with them an appreciation and understanding of the tropes created and used by these RPGs. Manifesting itself within their works, this understanding allows them to make games that are more self-aware. Some games are content to just lampshade and acknowledge those very tropes, laughing them off as an in-joke between the designers and the players. Others exist to show the potential implications behind them; to demonstrate the potential horrors of a world where those tropes we take for granted in games are reality. Undertale is one such game, and it has a damning, if not subtle, message to deliver to its player base. Created by Toby Fox, Undertale is an RPG, inspired by the likes of Earthbound. What separates it from other small-budget, independently-developed RPGs is that it bills itself as a “friendly” game. Though the player encounters random enemies while exploring, they never have to kill any one of them. This isn't necessary new, as Shin Megami Tensei has frequently allowed players to converse with and recruit demons. However, Undertale takes this basic concept to a logical extreme. Every enemy, even the bosses, can be dealt with without dealing a lethal blow. This is the way in which Undertale helps set the stage for its moral lessons. In most RPGs, players fight and kill hundreds, if not thousands, of creatures over the course of the game, with little regard for their lives. To the players, and to the protagonists, they are nothing more than speed bumps in the road to their objective. Undertale asks what kind of person is this protagonist, and what kind of effect would that person have on those around him. If the player chooses to murder every enemy they encounter, they'll begin to see the effects quickly. Towns and areas will become depopulated, devoid of life. Shopkeepers will abandon their stores and their stock before the protagonist arrives in an effort to escape the carnage with their lives intact. City guards and brave heroes will attempt to stop them in their tracks. In other words, the player who murders every enemy they encounter, who acts like any other RPG protagonist, is a complete genocidal-maniac. To rack up such a high kill count and slaughter so many, they would have to be. By implication, Undertale is saying that this would be true of the lead protagonists of most RPGs and the company those “heroes” keep. Simply by adventuring and fighting against all these creatures, they are complicit in mass homicide. Even if the opponents aren't sapient, the kind of damage that would ensue on the ecosystem would make life nearly unsustainable. Undertale claims that although we see them as heroes from our viewpoint, the damage they do would only make a bad situation worse. As players, we take for granted that we are in the right, or at least trying to do good. Undertale questions the wisdom of saying that we are morally correct just because we are playing as the protagonist. But that is not the only RPG mechanic Undertale challenges by exploring its implications. The idea of replaying games with multiple endings, and seeing “all that a game has to offer” also comes into close scrutiny. At any point before beating the game, the player is allowed to start over from the beginning. However, characters in the story will remember and comment on what choices they made in their previous playthrough. Most will discover this in the same way I did. The first boss in the game is your maternal figure, Toriel, who guides you and protects you at the start. In my first run, I had not realized that the trick to saving her is to constantly use the Spare option until she gives up, and my ignorance killed her. Regretting my actions, I consulted the wiki and learned how to keep her from dying. I reset my playthrough and used the non-lethal method to win the boss fight. Immediately afterward, the next character I spoke to mocked me for “growing a conscience” and redoing that section of the game to spare her. For going back to see the alternate outcome, I was chastised by the very game I was playing. Continuing along this theme, should the player get the Pacifist ending, for never killing a single thing and completing all the prerequisite side content, they are given the option to perform a True Reset, essentially erasing not only the current save, but any record that previous runs ever occurred, returning the game to a factory-standard. When the player launches the game after unlocking this option, one character appears on screen begging them not to use it. By doing so, they claim that the player would be erasing the happy endings that the cast had earned throughout the game, a fate more cruel than anything else that could happen to them. All of this boils down to Undertale's one, overarching message: Even though the content exists in the game's files, it isn’t something the audience necessarily needs to see. The game is blatant in the way that it encourages its players to save everyone and avoiding making even a single kill. That said, the option to ignore its warnings and embark on a bloody campaign exists. It's there, but it is something that players absolutely have to experience this content? Do they have to sacrifice the good times they had with the friends they made along the way in the service of seeing every bit of content on offer? Are all those lives the player took worth the Genocide ending? And if they aren't, is it even worth the time it takes to look up a YouTube video showing the differences? Undertale ponders these questions and answers with a definitive “no”. All these choices exist, but in reality the game considers the first playthrough to be the only thing worth the player’s time. Anything else being needless fluff padding out your time with it. Though Undertale lacks a subtlety regarding the way it challenges these tropes used in the vast majority of RPG game design, there is no denying that is does challenge them. Lately, there have been more and more games that deconstruct and analyze their own medium. Given that the generation that grew up on gaming has finally matured to the point where it can enter the industry proper, I expect to see more of these deconstructions as time goes on. Like Undertale, their creators have something to say about the games they played growing up, and now they have the means and opportunity to express those thoughts.